Haven’t had a chance to grab The Minish Cap since it was released on the Virtual Console for Wii U in 2014? Now is a fantastic opportunity to do so as it currently has a $2.49 discount as part of the Winter Warm-Up eShop sale. Originally released back in 2004, it is considered one of the best 2D Zelda games. Is Now the Right Time for Twilight Princess HD? For the sixth week in a row, the first 3D Zelda title, Ocarina of Time, is still in second place in the Wii U eShop sales charts. 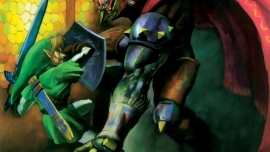 As we stated before, Ocarina of Time simply won’t go away. Trailing behind in 3rd place is Mario 64, and in first place is a more modern game: Splatoon. This begs the question: when will Ocarina of Time slip out of the top 5? Last month, Nintendo decided to release the N64 Virtual Console version of The Legend of Zelda: Ocarina of Time on the Wii U eShop. Since then, the response has been phenomenal, despite the fact that its 3D remake is widely available on the Nintendo 3DS. It comes as no surprise to any of us that Zelda games can still find spots in charts, even months after release and this week definitely hasn’t been any different: three games have made the Top 20 chart on the Nintendo eShop this week – The Legend of Zelda ranked at 13th, Link’s Awakening DX at 14th, and Ocarina of Time 3D at number 16.